On his arrival in Los Angeles Funes ... will meet with senior representatives of a well known business with a presence in all Latin America. The agenda of the presidential candidate includes on Thursday a meeting in the Biltmore Hotel with more than a hundred leaders of the Salvadoran community in the United States, businessmen, professionals and some Latin American diplomats....In recent months the presidential candidate has had numerous meetings with small medium and large businesses, to whom he has transmitted his message of certainty. Many of them have already expressed their support. That's a far cry from the rhetoric of the orthodox old guard who ran the presidential campaign of Schafik Handal in 2004. A group of US Peace Corps Vounteers decided to act out an anti-littering message on buses operating around San Miguel. Watch their video. Reception was pretty good - we'd sit on the bus afterwards for a while, and lots of people would ask questions about who we were and why were doing this. Some people put trash in Jesus' bag when he went around. On some of the buses people clapped and cheered when we finished. Last Sunday, El Salvador's national football (soccer) team came from behind to defeat Panama 3-1 in a game played in San Salvador. La Prensa Grafica has coverage, as does Peace Corps Volunteer Laura who was at the game. You can also watch this video of highlights from the match. By winning, El Salvador moves to the next qualifying round with a round robin tournament including Haiti, Suriname and Costa Rica during the fall. The top two teams will then advance to the final round of the CONCACAF World Cup 2010 qualifying tournament. Also circulating on the Internet is a video of Mauricio Funes in attendance and supporting the local team. The video shows large groups of fans apparently spontaneously breaking into applause at the site of Funes. Not to be outdone in support of the team, president Tony Saca awarded a $1000 bonus to each member of the winning national team. Larissa “Lari” Maria Hotra is an AP Peace Fellow with Survivor Corps (formally the Landmine Survivors Network) in El Salvador. She is a first year Master’s student at George Washington University’s Elliott School of International Affairs. She is concentrating on conflict resolution, with a thematic focus on human rights. The Institute for the Study of Public Opinion (IUDOP) at the University of Central America has released the results of a study of the opinions of more than 1200 Salvadoran youth polled during July 2007. The study is too lengthy to summarize here in any meaningful fashion, but it is well worth reading if you want to get the views of youth about their prospects, their family situations, their attitudes toward the country's institutions and more. (Sorry, it's only available in Spanish). I know that many people who read this blog do so because they travel to El Salvador on church mission trips -- perhaps to build houses with Habitat for Humanity, to run a medical clinic, or to drill a well. I am often asked about how to stay safe in El Salvador. One thing I uniformly answer is that more people die on mission trips to El Salvador drowning in the ocean than for any other cause. I was reminded of this again when I read today of the tragic death of a 54-year old man from Bloomington, Illinois who drowned while swimming off the coast of El Salvador. He had traveled to El Salvador with his church to work on building houses for the poor. The left has never won an election in El Salvador, and picking a moderate candidate for the March 2009 vote reflects a determination by the Farabundo Marti National Liberation Front, or FMLN, to shake off its Marxist roots. 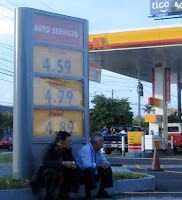 The bus operators of El Salvador are getting squeezed by high fuel prices. The law does not allow them to raise fares to cover those increased fuel costs. The government has dragged its feet on increasing the subsidy to drivers which allows them to cover their costs. So bus operators on some routes have begun illegally charging more than the set fare. They are demanding as much as 35 cents on routes supposedly capped at 25 cents. The Center for the Defense of the Consumer has denounced the illegal price increases and critiqued the government for not acting against the bus operators. It has proposed that bus operators who charge the increased fare should lose their concession to operate. The CDC calculates that fares of 35 cents would consume as much as 8-18% of a family's budget if two members needed to ride buses to get to minimum wage jobs. [W]ith last month’s release of the 2007 National Census, the Salvadoran Government has tried to paint a brighter picture, fueling the ongoing controversy. ANDA recently claimed that the Census results prove that 8 out of 10 Salvadoran families now have access to potable water. However, according to the CDC [Center for the Defense of the Consumer], who cite United Nations Development Program numbers, that claim is deceptive. 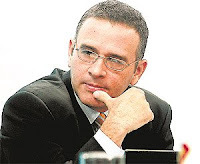 Rodrigo Ávila and Mauricio Funes are in the midst of the campaign for the presidency of El Salvador, although elections are not until March 2009. I decided to take a look at how the campaigns are using the internet. The campaign website of Rodrigo Ávila, www.rodrigopresidente.com, has a clean, traditional design with lots of use of multimedia -- videos, audio clips and photo galleries. There is a candidate's blog (although the most recent entry is from February). It could be any political candidate's website in the US (and one blogger pointed out the similarity in typefaces, color scheme and general layout with the website of Barrack Obama). On a nearby headland, in the shade of some palm trees overlooking Las Flores beach, Rodrigo Barraza checks his plans and looks out across an area where the dense foliage has been cleared. He is the architect of a new development of eight luxury villas and a spa. In the complex, which is called Utopia, the owners will each have their own gardens, swimming pools and views of the ocean. It is the first such building of its kind in this region. They are for sale off-plan within the next few weeks with an asking price of hundreds of thousands of dollars. Mr Barraza says that sustainable building methods are being used. He says: "This is a hidden place, and we want to keep it from mass tourism and commercial profit... We are trying to keep it in its natural state." El Salvador is expected to send 52 soldiers to join the UN peacekeeping mission in Lebanon, the country's Defense Ministry announced Friday....The military contingent will first travel to Spain on Monday to receive one-month training. The soldiers will join the UN peacekeeping troops in Lebanon, the ministry said, adding that the training will help them "achieve the given mission." El Salvador's parliament adopted a resolution Thursday night, giving green light to the peacekeeping mission in Lebanon. The opposition parties also supported the resolution, although they opposed sending troops to Iraq because they considered it an illegal war. 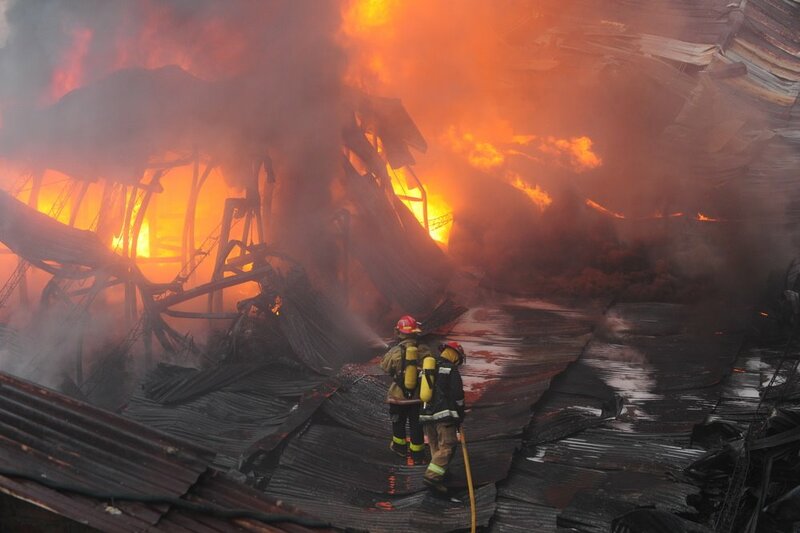 Yesterday, a plastics factory essentially blew up in Soyapango. "Soya", as it's known, aside from being one of the largest municipalities in El Salvador, is one of the most dangerous and corrupt. The mayor of Soyapango is known as "El Diablo Ortiz", or "the devil Ortiz". There are some nice places in Soyapango, but the local government has essentially forgotten the people and local infrastructure and the whole area is like some kind of red headed stepchild. A news story in El Diario de Hoy reports that the Grupo Roble real estate firm will build the tallest building in Central America (outside of Panama) in San Salvador. The 28 floor tower will contain 88 luxury apartments starting from $348,000 and will be located next to the Multiplaza shopping center. You could dismiss this story because this housing is well out of the financial reach of the vast majority of Salvadorans. But a sizable construction project always brings with it paying jobs and an investment in the local economy. As an export crop, coffee has long played a role in the history and economy of El Salvador. The coffee industry this year made good gains and showed additional growth of gourmet coffees raised with environmentally sensitive practices. Coffee exports for 2007-08 increased 24% to 994,538 60 kg. bags over the prior year according to the Salvadoran Coffee Council. Sometimes when you read an article in the news, a statistic jumps out at you and you wonder if it could possibly be true. That was the case when I was reading an online article from the Loudoun Times in Loudon, Virginia. The article tells the story of a 13 year old Boy Scout who is about to be deported back to El Salvador. He had entered the country illegally about 3 years ago to join his mother, who is a Salvadoran legally working and residing in Virginia. The article is another tale of how immigration laws can separate families and is worth reading. The statistic in the article which jumped out at me was this one:Over 88 percent of the children who are apprehended across the border come from El Salvador. A rampant culture of impunity, combined with poverty and desperation after the war has led to constistantly high levels of migration. Strict immigration laws have punished those looking for livelihood improvements and deportation has spawned El Salvador's serious gang problem, further trapping the country in a cycle of violence, poverty, and... more immigration. An important lynch-pin in this cycle is remittances or remesas as they are known in Spanish: money sent home by working immigrants abroad. While the article has some logical jumps when it comes to cause and effect, it does give you an overview of some of the role remittances play in El Salvador's economy. Press releases from the Vatican announced this week that Salvadoran president Tony Saca will receive the "Path to Peace" award in recognition of his commitment to the development of peace in the national and international arenas. The award is made by the Path to Peace Foundation which advances the Catholic church's pursuit of peace in the world on the international forum of the United Nations. "According to a press release from the Holy See’s permanent observer mission, President Saca was chosen for his efforts in upholding the peace agreements reached between the Salvadoran government and rebel groups." A list of previous Path to Peace Award winners can be found at this link. I was used to confronting power. But now I am confronting a much darker power, one that is much more blind and irrational. As a journalist my work signified a threat to the status quo. But the powers that be shut down my ability to continue to carry out my journalism work; they undermined economically the companies that I worked for. Now as a candidate the situation is different, because as a candidate I am confronting a blind, intolerant, autocratic and excluding power that is very afraid of different parties taking a turn in office. It is very afraid of the alternative being built for exercising public power, especially at the level of the presidency. And it is willing to do anything and use any method to block that alternative. Los Ausoles is located in the department of Ahuachapan, right outside the city of the same name by the geothermic plant La Geo. They're smoke-spewing fumaroles (vents?) that you can walk right up to, as well as boiling mud and hot springs. Smelled a bit like when the water softener at home in Ohio isn't working, but stronger. The best part was that it was just kinda there, free for anyone to walk right up to (or into if you weren't paying attention). Los Ausoles is definitely on my list of cool things that I've seen in El Salvador that most people don't even know exist. The map at this link shows the areas in the country which are at risk of flooding when there are heavy rains in El Salvador. A gourmet coffee growers cooperative in El Salvador plans to open a lending arm to give members access to cash for farm improvements and help protect them against coffee market downturns. That is why the San Jose de la Majada coffee cooperative is branching out, using money saved from coffee sales and investments over its four-decade history to open a financing arm for members. The Harry Ransom Center at The University of Texas at Austin is hosting a photography exhibition titled "Inside El Salvador," which includes more than 100 black-and-white images concerning the country's civil war and its aftermath. The exhibition runs from April 17 through Aug. 3. You can see many photos from the exhibition at the website for the exhibition. You can also find transcripts, video and slideshows of presentations by photographers and others done in connection with the show. If you are in the vicinity of Austin, Texas, the exhibit would be well worth a visit.